Has unexpected maintenance or repairs brought your conveyor belt systems to a standstill? Remember, time doesn't stand still and neither should your conveyor belts. Time lost can result in significantly reduced production and profit. 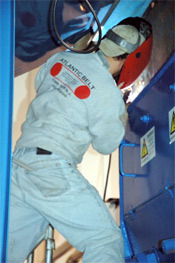 Sometimes routine conveyor belt maintenance gets sidelined as "low priority" until it turns into unscheduled downtime. Turning this regular maintenance or repair work over to Atlantic Belt and Industrial Supply will free up your in-plant maintenance crew to focus on more important projects and minimize the downtime of your conveyor systems, allowing your business to operate at full capacity. The staff at Atlantic Belt is available in our retail store during the hours of 8:00 am - 5:00 pm, Monday through Friday. We can assist you in purchasing parts and industrial supplies from our large inventory at this location.